The troubles facing the iconic General Electric Company (NYSE:GE) have captured business headlines for years. Although some believe the diversified industrial giant is starting to steady the ship, it has been working from a position of weakness. ABB (NYSE:ABB), Wabtec (NYSE:WAB), and now Danaher (NYSE:DHR) have all been happy to help their sickly competitor out by acquiring assets. Here's why. ABB is one of the largest providers of electrical equipment and services in the world. The European company isn't particularly well-known in the United States, as roughly 75% of its sales come from non-U.S. markets. However, it has been repositioning itself to become a bigger player on the world stage, and the United States is a key global market. ABB bought GE's industrial solutions group in mid-2018. The purchase price was $2.6 billion, and ABB expects the acquisition to add to earnings in the very first year. ABB has highlighted two big anticipated benefits. First, the company expanded its U.S. footprint as it added all of GE's customers, which it now gets to serve. Second, ABB believes it will be able to improve the division's margins by wringing out costs. By the fifth year, the company expects to have achieved $200 million in annual cost savings. Down 18% over the past year and sporting a 4.2% yield, ABB stock should be of interest to income investors. The purchase of GE's industrial solutions group increases the company's scale in a key global market and gives it a solid lineup of cost-cutting opportunities to help push results higher over the next five years. That said, acquisition synergies are always a big question mark. If you are looking at ABB as it looks to take advantage of GE's troubles, make sure to keep track of the progress it makes on its cost-cutting goals. Check out the latest earnings call transcripts for General Electric and other companies we cover. Westinghouse Air Brake Technologies, which does business as Wabtec, was a leader in the transportation space, providing freight car products, locomotive electronics, brakes, heat exchangers, and transit components and systems. Via a somewhat complicated merger, it acquired GE's transportation division in early 2019, adding General Electric's railway business to the fold, along with many other markets the company served. As with the ABB deal, one of the biggest benefits of this agreement was the ability of Wabtec to take on GE's large installed customer base. Aftermarket sales are a big piece of the company's business, so adding all of GE's customers is a big deal. The other draw was the ability to roughly double in size with a single transaction, pushing revenue up from around $4.4 billion in 2018 to a projected $8.4 billion in 2019. And the cost of the deal was relatively modest, with Wabtec giving GE just $2.9 billion in cash and a roughly 25% stake in the company (which GE intends to sell). GE shareholders will own around 24%. What's most exciting about this deal for Wabtec, whose stock is down around 11% over the past year, is that it occurred during a low point for the cyclical rail industry. GE's transportation division sold just 272 locomotives in 2018, but averages close to 600 through the entire cycle. In other words, Wabtec's timing looks really good. 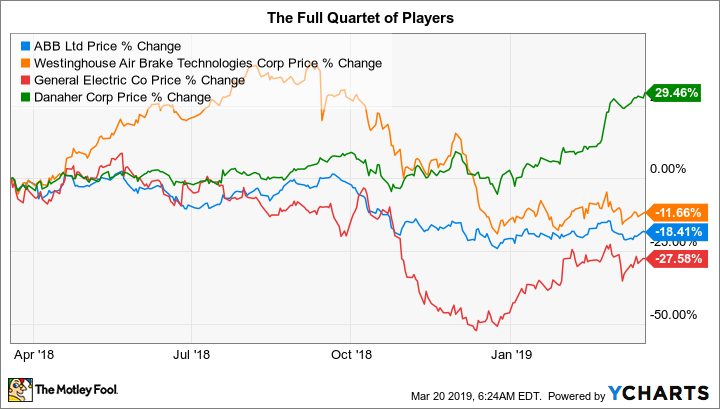 Investors attracted to that recovery opportunity should watch the locomotive market and Wabtec's ability to come through on its cost-saving goals (in the fourth year, it expects savings to be at a run rate of $250 million a year). That said, it's also worth noting that the company's aftermarket business is set to account for around half of revenue in 2019, up from roughly 40% before the tie-up, adding a bit of stability to the top line. The last big deal that GE inked has yet to be completed, but it's probably the most important for the industrial giant. It agreed to sell part of its healthcare division to Danaher for $21 billion in cash. That infusion will give GE's management team some much-needed breathing room and, likely, reduce the need to sell assets at what some industry watchers have described as desperate prices. Danaher, for its part, is getting GE's biopharma business, which sells products into the healthcare sector to support drug discovery. This move will help speed up Danaher's repositioning effort, as the company looks to get out of slower-growth businesses, such as its dental operations (which it intends to spin off), so it can double down on higher-growth operations, like the life sciences division into which GE's biopharma operations are likely to be folded. The deal is expected to close in the fourth quarter of 2019 and add to earnings in 2020. GE's healthcare division is one of its best performers, so this wasn't an asset bought on industry weakness (like the two above). The growth opportunity is the big draw for Danaher. 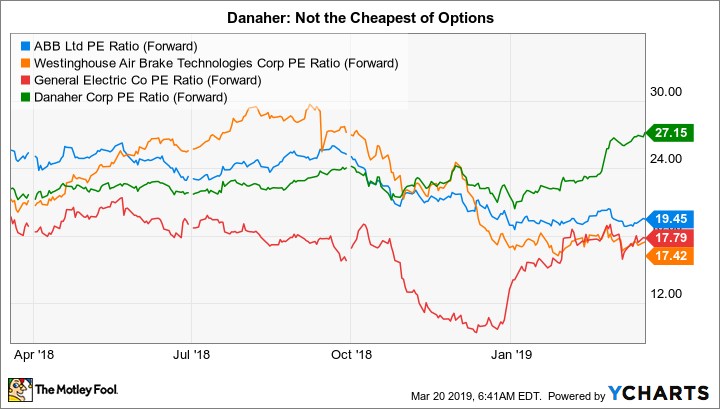 There's a long time to go before this deal closes, but for growth-minded investors, it's worth taking a deep dive into Danaher. With a forward price-to-earnings ratio of roughly 27, it isn't the cheapest name on this list. However, you might decide that the company's growth potential, which its purchase should augment, is worth paying up for. When a company is on the rocks, it can be forced to do things that it normally wouldn't even consider. GE is on the rocks and ABB, Wabtec, and Danaher have been more than happy to help it survive. Far from being altruistic, however, these three competitors are hoping that they have picked up valuable assets (relatively) on the cheap. ABB is worth a deep dive for dividend investors. Those who believe an upturn in the locomotive market is in the cards should look into Wabtec. And while it's a little too soon to make a call on Danaher, growth investors might want to watch how the transaction progresses from here.